I realize that my blog has been inundated by recipes for rich, indulgent sweets and desserts, and for that I'm sorry. Well not too sorry, actually - it has all been quite tasty. But I have been eating something other than chocolate cheesecake and cookies. In fact, I've been eating some pretty delicious dinners. 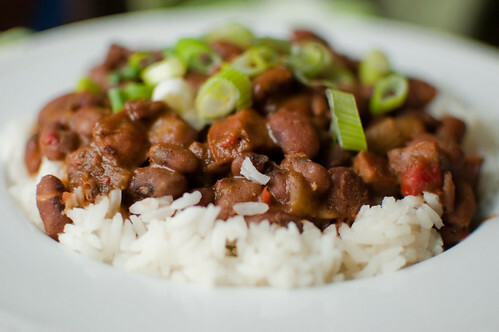 Like this red beans and rice recipe. It is also relatively healthy, which is a nice bonus during the time of year for overindulgence. Years ago, when I was a vegetarian, red beans and rice was one of my favorite dinners that my mom prepared. And while this is reminiscent of that dinner, this version has both bacon and andouille sausage. So vegetarian it is not, but delicious it is. I used to shy away from any recipe that starts with dried beans, but I don't know why. They aren't difficult to prepare, and they have much less sodium than the canned variety. And as they cook, they become so creamy and delicious. Sure, they take longer to cook, but in that time they are permeated by all sorts of delicious flavors. The recipe calls for an overnight soak, but I opted for a quick-brine and only soaked them for an hour. Both versions are included below. This meal does take some time to cook, but most of it is inactive. Its a great dinner to make on a cold day when you don't want to leave the house. There are a few noteworthy ingredients in this recipe. The red wine vinegar may seem a little out of place, but it provides a really nice acidic bite to the final dish. And the scallions gave the whole dish a nice and fresh brightness. The bacon may seem a little out of place, but tasso is traditionally used in Louisiana. However, it can be hard to find outside of the area, so bacon plus some additional spices makes an acceptable substitute. And finally, in an effort to make this a little healthier, I used chicken andouille sausage in lieu of traditional pork sausage. We all really enjoyed this dinner, and Caroline practically inhaled it. It really was the perfect dinner to enjoy on a cold night (along with some traditional Southern cornbread), and I am certain I'll be making this dinner all winter long. Dissolve 3 tablespoons of salt in 4 quarts of water in a large pot and add the beans. For the overnight brine, allow to soak at least 8 hours, or up to 24 hours. For the quick-soak method, bring the pot to a boil over high heat. Boil for 1 minute, then remove from heat, cover, and stand for 1 hour. Drain and rinse the beans. In a large dutch oven, cook the bacon over medium heat, stirring frequently. Cook until browned and almost fully rendered, 5 to 8 minutes. Add the onion, bell pepper, and celery, and cook, stirring frequently, until softened, 6-7 minutes. Add the garlic, bay leaves, thyme, paprika, cayenne pepper, and 1/4 teaspoon black pepper. Cook until fragrant, about 1 minutes, stirring constantly. Stir in beans, broth, and water. Bring to a boil over high heat, then reduce heat but just enough to still maintain a vigorous simmer. Stirring occasionally, cook 45-60 minutes, or until the beans are soft and the liquid has begun to thicken. Stir in the sausage and 2 teaspoons of the red wine vinegar. Cook until the liquid is thick and the beans are fully tender and creamy, about 30 minutes. Season to taste with additional salt, pepper, and vinegar. Serve over rice, sprinkled with scallions and passed with hot sauce. This sounds delicious! Great twist on a classic! We love beans and I have nearly all the ingredients on hand. Thanks for sharing this recipe. It's bookmarked and I'm looking forward to this dish (and the leftovers!). This has a very nice twist. I have also my own version of this one but yours looks more delicious. I made your recipe and so, so good. I used a mix of poblano and red bell peppers, instead of green, and italian sausage, instead of andouille, because that's what I had on hand. Still, just delicious. Thanks for sharing. Cindy, I'm so glad you liked it! I really love this dish too - and it's nice to know it's so adaptable!